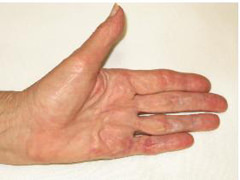 This case study involves a 73 year-old female with severe Dupuytren’s Contracture of the MCP and PIP joint of the little finger on her left hand. She had no prior surgeries on the left hand. 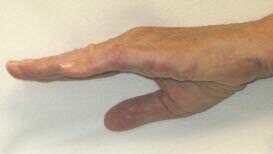 Before surgery, her MCP joint lacked 75º and the PIP joint lacked 80º. During surgery a fasciectomy was performed and one Digit Widget was applied. Her sutures were removed two weeks later and the extension torque was initiated. At this time, the PIP lacked 53º of extension. One week later, she lacked only 10º extension and had some swelling. The patient was told to remove the lightweight bands more frequently and to perform active flexion exercises. The following week, she had a nearly full active range of motion with only minimal swelling. 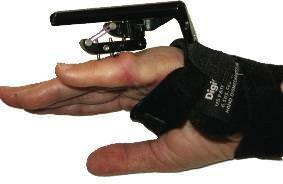 The patient wore the Digit Widget for six weeks, five of those weeks after she had gained full extension. 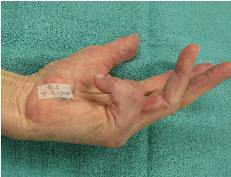 Keeping the device on for several weeks after full extension is obtained helps with scar remodeling and reduces contracture recurrence due to scar shortening.